Few topics raise blood pressure among camper trailer owners like 12V electronics. Wanna-be experts and gunna-do-its will inundate you with so many theories, rumours and so much misinformation, it’s often difficult to find firm ground in this rapidly evolving area. Even automotive experts unfamiliar with camper trailer set-ups can underestimate the shortfalls occurring as a result of voltage drop. 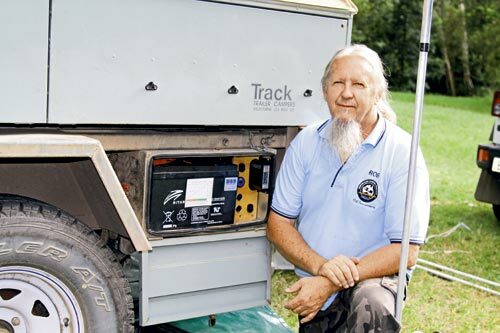 So, rather than contract the wrong person to install a battery and charging system in his trailer, camping advocate Rob Sanderson decided to install the battery system himself. Rob and his wife Carol bought their Track Trailer Eagle second-hand 20 years ago. Rob is the co-owner of campertrailers.org, so he and his wife enjoy many hours on the road and at camping functions. Rob is now retired and has to watch his pennies but he’s well-connected and was confident he could get the job done with the right advice. Although a lesser system may have served Rob well in the beginning, his initial research and financial investment resulted in a set-up that could be adapted to meet the couple’s increasing power needs, which included a new fridge and Carol’s CPAP machine. As with many camper trailer installations, the Eagle’s battery storage capacity was limited by physical space, as high amp-hour capacity batteries tend to be large. Rob found room for two 120Ah Ritar AGM batteries in sealed storage lockers on either side of his camper for a healthy 240Ah of storage. The Ritar RA12-120 acts both as a storage and cranking battery so, in a worst case scenario, Rob can use one to start his car. For more information on battery systems: check out our auxiliary battery system guide. Rob chose 6-B&S cabling to minimise voltage drops in proportion to the distance in cabling. Too much electrical current travelling the length of a camper trailer can cause thin wires to overheat, wasting vital current. Furthermore, overheating can cause copper to crystalise, reducing its ability to sustain current flow. The 6-B&S cable is recommended as the standard, but, because it’s large and all copper, it’s not cheap. It’s a good idea to measure carefully before you buy. For solar input, Rob chose two high quality 65W Kyocera panels and purchased several ancillaries through eBay. Rob drew a diagram of his proposed battery system and sent it to Jamie Hazelden from Jamie’s Touring Solutions, who sold him the panels. Having got the nod from the 12V electrics expert, he installed the batteries in the Eagle using the 6-B&S cable and fitted six 12V outlets throughout. He also wired a fuse box into the trailer using 4mm twin-core sheathed cable and installed an Anderson plug on the drawbar to take the incoming charge from the Jeep’s alternator. Rob uses a meter designed for model aircraft to calculate his appliance's consumption. The Watt's Up meter measures power (W), current (A), voltage (V) and Ah consumption with great accuracy at a fraction of an amp. Rob installed the Watt's Up meter on top of the junction box. The whole set-up worked like a dream until the couple replaced their old fridge with a 40L Engel and hooked up Carol’s CPAP machine. The set-up required six hours of sunlight to replenish, forcing the campers to overnight at caravan parks at the slightest hint of a cloud. Rob thought a third solar panel would resolve the issue but was steered towards a 25A Redarc BCDC 1225 charger instead. 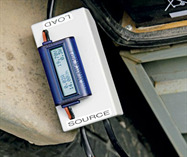 This smart charger converts the current drawn from the alternator to 25A at a point close to the auxiliary batteries. Rob and Carol could now travel several hours from one campsite and arrive at the next with their trailer batteries fully charged, compared to the approximate 70-75 per cent state they were averaging via the direct connection to the Jeep’s alternator. 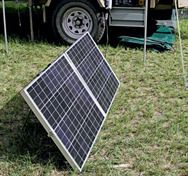 The BCDC 1225 also came with an MPPT solar regulator input, which captures up to 95 per cent of the wattage generated from the couple’s solar array, compared to 70 per cent offered on a standard regulator. Rob chose the Redarc product as it is made by an Australian company that offers an informative forum and helpline, should he need advice part-way through a fix. Although the charger was supplied with several drawings, Rob drew plans to suit his own needs and forwarded them onto Redarc and Jamie Hazelden for feedback. Rob wanted to use solar power to charge the car battery via the panels’ existing PL1210 regulator as required, but feed unregulated solar power to the BCDC charger’s internal regulator to avoid needless loss in wattage. To achieve this, the set-up required some rewiring but the core elements remained. Two Anderson plug outlets were wired at the back of the panels. Rob chose a red 50A Anderson plug for the unregulated current as a visual reminder and fitted it independently of the solar panel regulator. Likewise, he chose a grey Anderson plug for the regulated current and installed it after the PL1210 regulator. 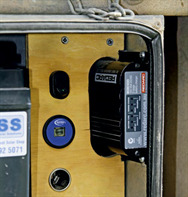 There are a few red Anderson plug inputs installed on the trailer which connect direct to the Redarc BCDC charger, allowing Rob to keep his panels in full sun regardless of the campsite’s orientation. Red and grey Anderson plugs will not connect to each other so they can’t be accidentally mixed. Rob uses a red 50A Anderson plug to charge from the alternator as he drives but is careful to disconnect it at camp before setting up the panels. Rob crimped, soldered, shrink-wrapped and taped the joins to and from the Redarc BCDC for optimal performance. “The Redarc BCDC chargers can pump out 25A and they have enough current to melt things, so I wanted to make sure it was bulletproof,” Rob said. At the couple’s current rate of consumption, the 12V electric set-up will charge in absorption mode for most of the morning, dropping into float by about 11am on a sunny day or 1pm in cloudy conditions. This is a vast improvement on the original set-up, which was unable to keep up with the couple’s power demands on an overcast day, causing a downward spiral of charge in the battery. So, was it a difficult task? Rob thinks not: “It’s really easy to do it yourself.